Despite the not-so-good weather condition, at least 534 senior citizens joined the “walk for life” led by PhilHealth at 5:00 in the morning of October 1, 2016 at the SMRAA Sports Complex in the City of Koronadal. Participants had their zumba before they were asked to walk around the oval and shared a meal with each other later. This program is in support to the Presidential Proclamation No. 470, s-1994 on elderly Filipino Week celebration every first week of October with this year’s theme, “pagmamahal at respeto ng nakababata, nagpapaligaya sa nakatatanda”. 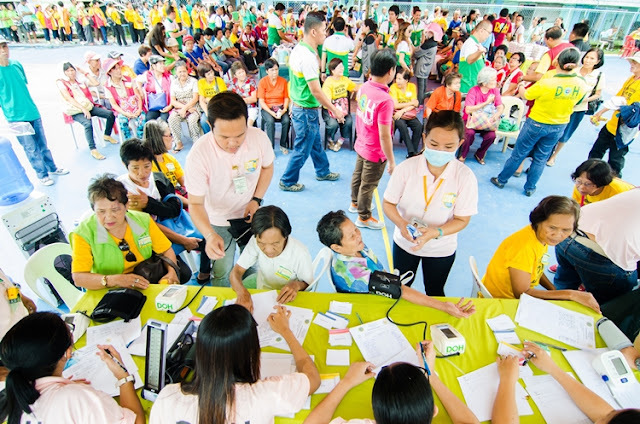 Participating agencies like the Department of Health XII provided free flu and pneumococcal vaccines, nutritional assessment, dental check-up and medical consultation with vital signs for BP and temperature. The Department of Social Welfare and Development answered queries on social services and the Provincial Security Unit, Philippine National Police and Bomb Squad & K9 of South Cotabato has given security. “Today, we are very happy that elderly men and women like us have availed of the privileges these government agencies have designed for us. We cannot thank them enough. We can only take good care of ourselves so as not to give so much burden on their part. Let us enjoy our remaining years by staying fit and healthy. Stay happy,” Region XII Senior Citizens Federation President, Ninfa T. Isla said. After sharing her thoughts, Isla led the group in singing and dancing their all-time favourite, “Ilongo ako nga Tunay” “Uhoy Alibangbang” and “Manang Biday”. PhilHealth XII Regional Vice President, Dr. Miriam Grace G. Pamonag on the other hand, assured the association of Philhealth’s support in terms of health care services. “We are just one phone call or one text away and our health care providers are there 24/7 for your emergency needs. I always believe that what comes around goes around. How you have taken good care of your elders before is the way how you are taken cared by us now. Sooner or later, we will reach your age and we will be experiencing the same. Just enjoy life and reap the fruits of your labor,” she said.